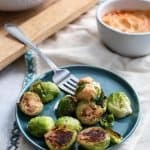 Simple Skillet Cinnamon Brussels Sprouts with spicy pumpkin aioli! 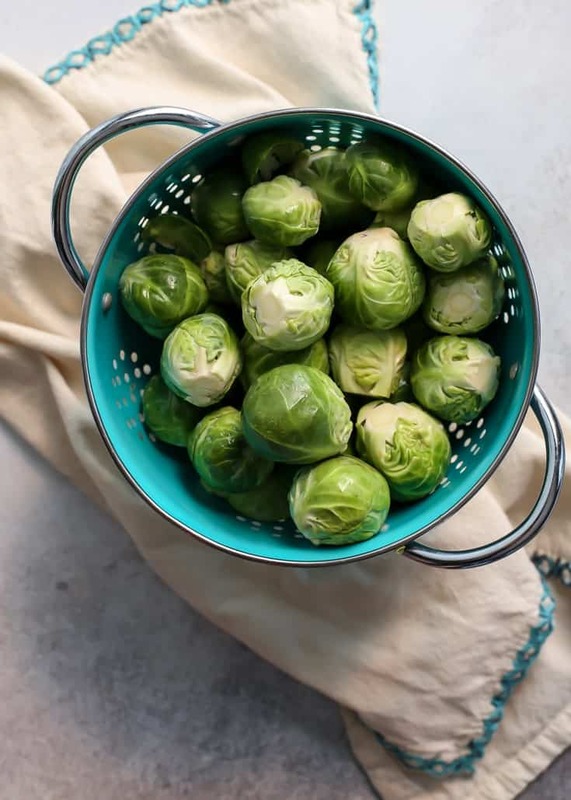 These brussels sprouts make a great side dish or fun party appetizer. 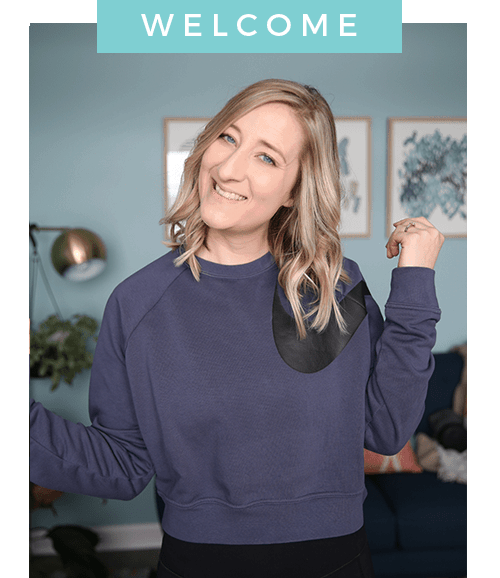 Paleo, vegan and whole30-friendly. AH WELL. You win some you lose some. 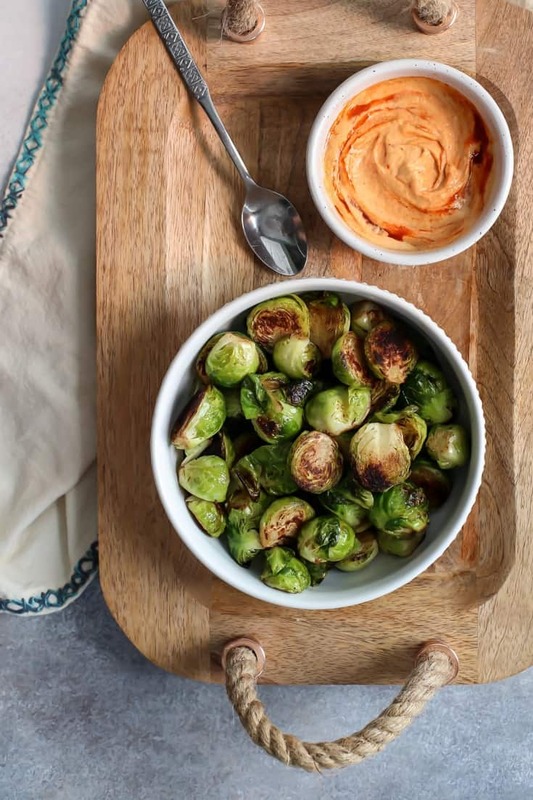 I think these Skillet Cinnamon Brussels Sprouts with spicy pumpkin aioli are definitely winning, though. It has been forever since I’ve made some goooood brussels sprouts and when I finally saw them in the produce aisle at Meijer, I had to go all out here with a new recipe. 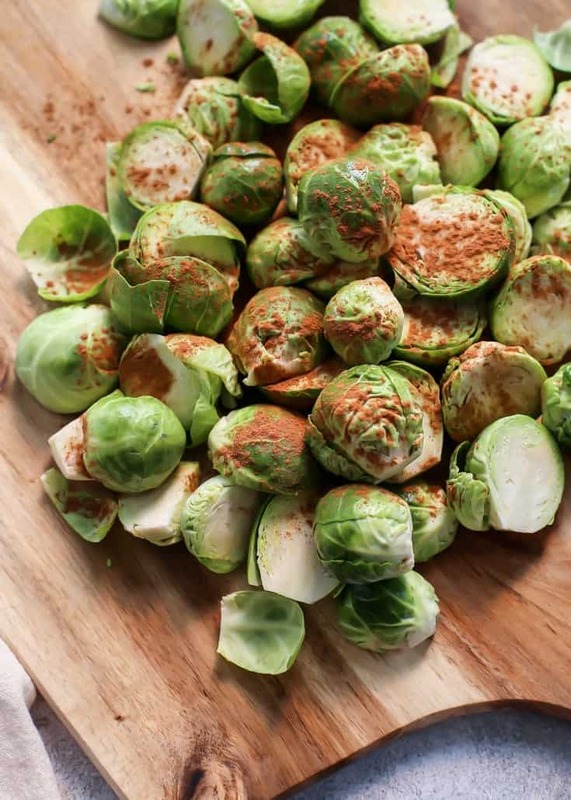 These cinnamon brussels sprouts are simple, paleo, vegan and Whole30-friendly. 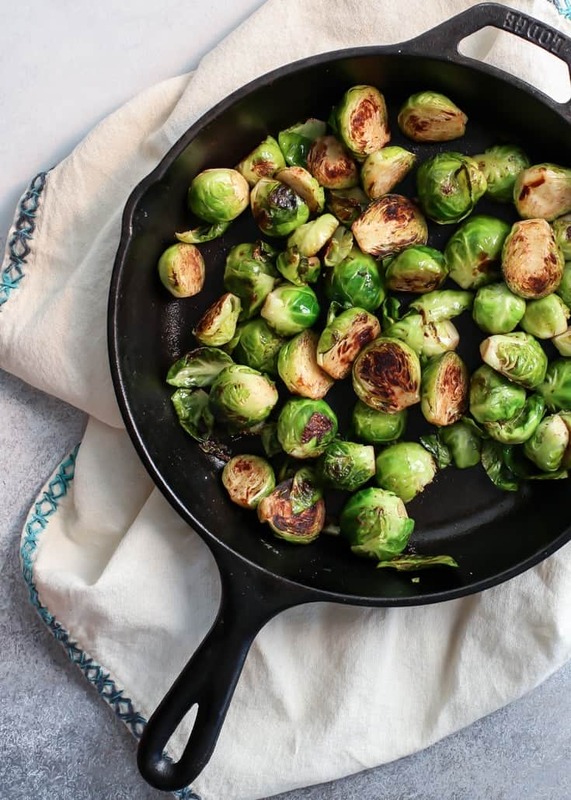 The brussels sprouts are tossed with oil and cinnamon and then get cooked in the stovetop on the skillet. I used my cast iron pan because I feel like it helps get the brussels sprouts more crispy. You can also roast the brussels sprouts at 375ºF for about 20-30 minutes, flipping halfway through. While the sprouts are cooking you can make the pumpkin aioli – a simple blend of pumpkin purée, quality mayo and Sriracha sauce. It’s stupid simple but tastes amazing! And then all thats left is to do a little dipping – when I dip you dip we dip. After brussels sprouts have been trimmed cut larger sprouts lengthwise, while leaving smaller ones whole. Toss in bowl with 2 tablespoons avocado oil and ground cinnamon, using hands to coat if necessary. Heat a large cast iron skillet over medium heat. Once the pan is hot add remaining avocado oil and coated cinnamon brussels sprouts in single layer. Cook brussels sprouts on one side, allowing them to sit for 3-4 minutes. Then toss and stir brussels sprouts to cook on other side, another 3-4 minutes. Lower heat if necessary and cook the brussels sprouts another 6-8 minutes, stirring occasionally, until sides are golden. Remove from heat and cover with lid. 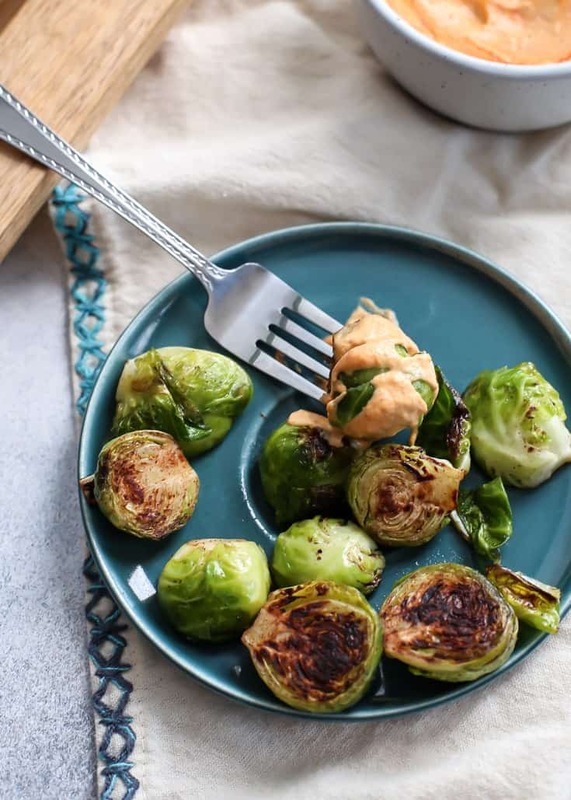 While the cooked brussels sprouts are resting in the pan make the spicy pumpkin aioli: simply mix together pumpkin puree, mayo and sriracha sauce until combined. 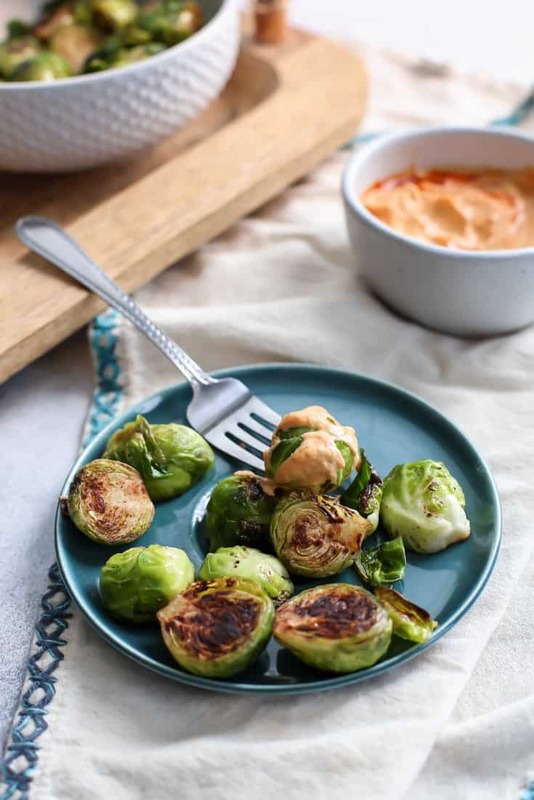 Serve brussels sprouts with spicy pumpkin aioli and enjoy as an appetizer or great side dish! *Feel free to use a paleo mayo or a vegan one! **If following paleo diet, I came across this sriracha. 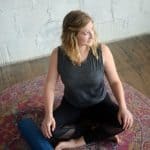 If following Whole30, try this homemade version. Such a good idea to add pumpkin aioli!! Perfect combo! Pumpkin PB sauce sounds great too! First time caller eating brussel sprouts. My vegan daughter and I loved them! And the pumpkin aioli..yum! Thank you! Hi Jennifer! I’m so glad you and your daughter enjoyed them! 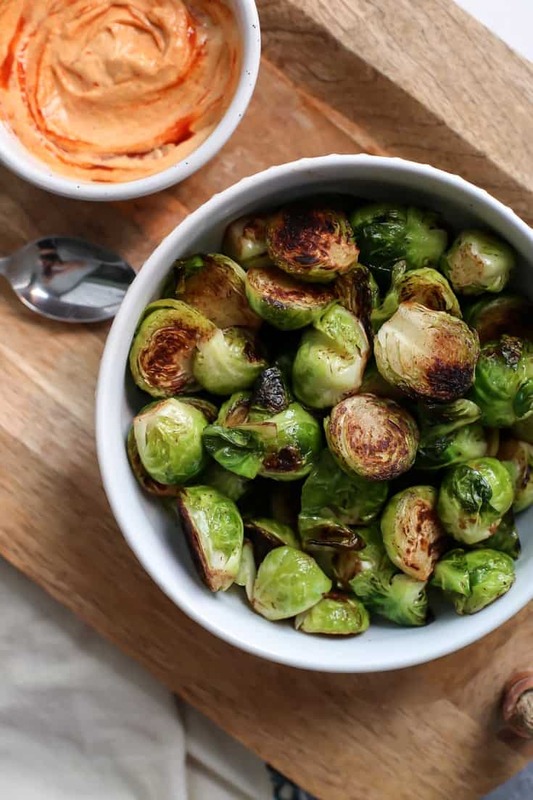 Brussels sprouts are probably my favorite roasted veggie, so I am happy to pass on the love 🙂 Thanks so much for stopping by and letting me know – I really appreciate it!